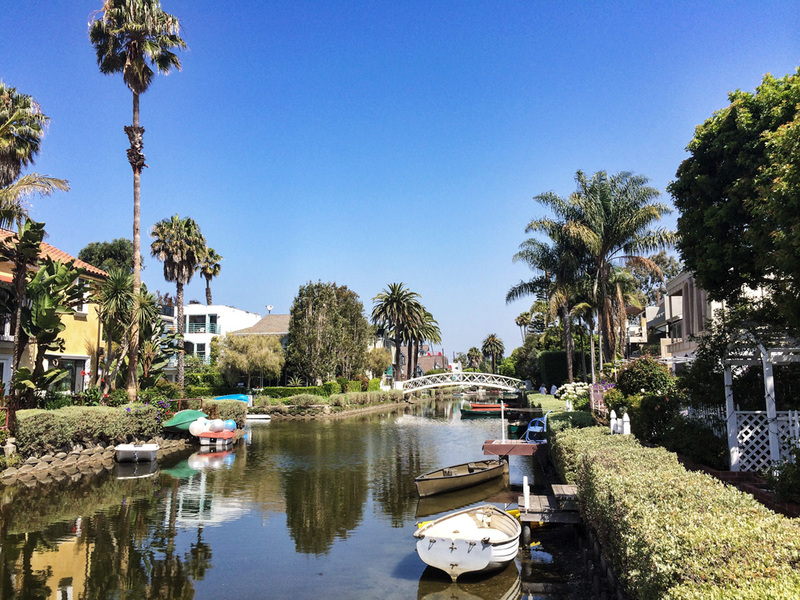 The Venice Beach canals — what a great, quiet place to stay in the LA area. 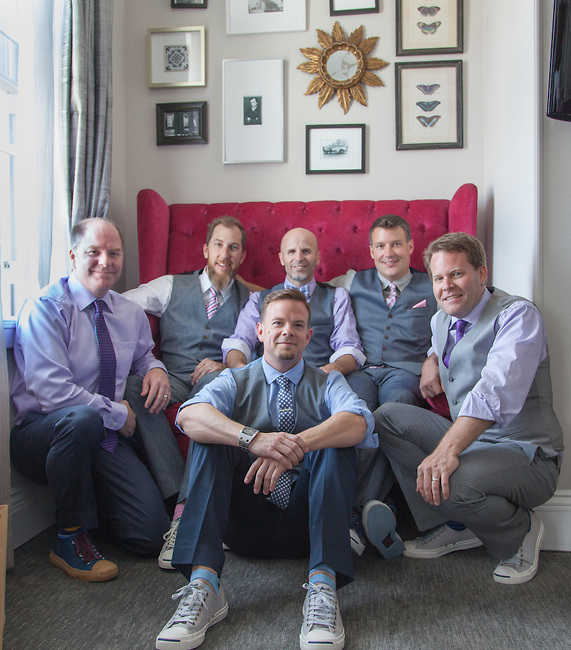 We made the trip down to Los Angeles in mid-June for my good friend’s wedding; Jonathan and Wendy were getting hitched and we weren’t going to miss it for the world. 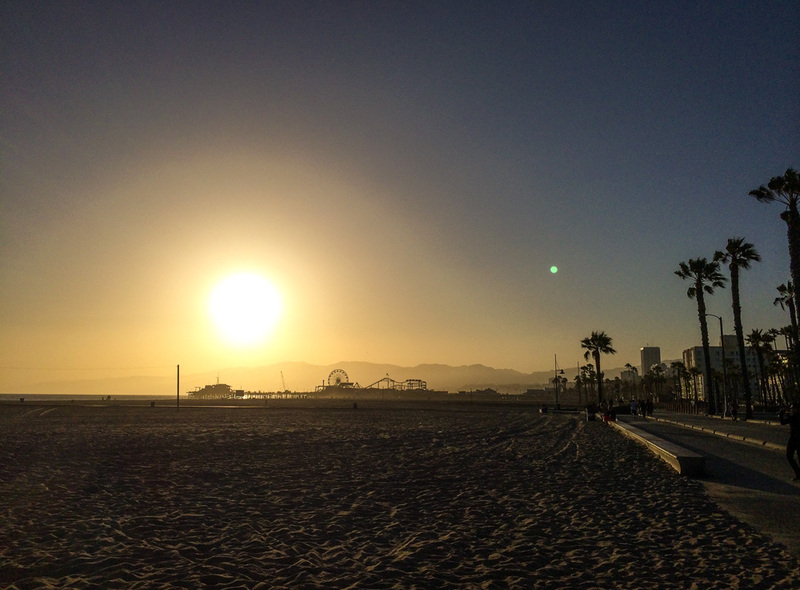 We planned a vacation around their wedding; staying in Venice Beach where it would be central to where we’d be going. 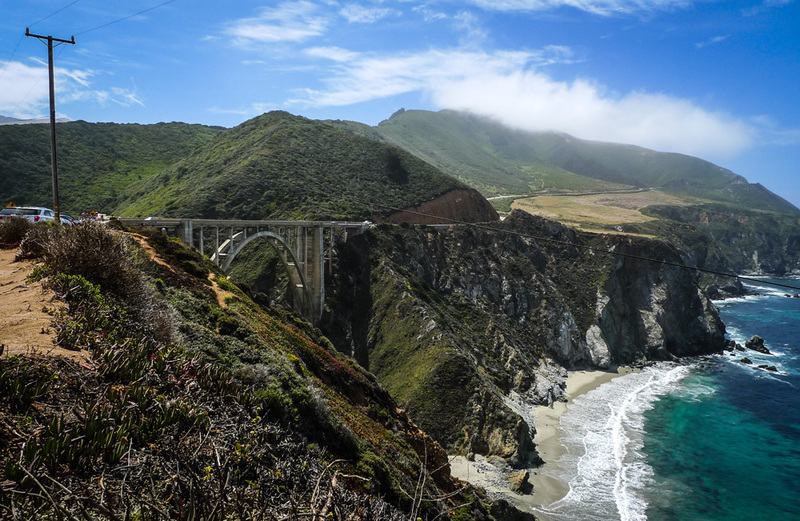 From Venice, we’d head up the coast through Big Sur and then fly out of San Francisco. 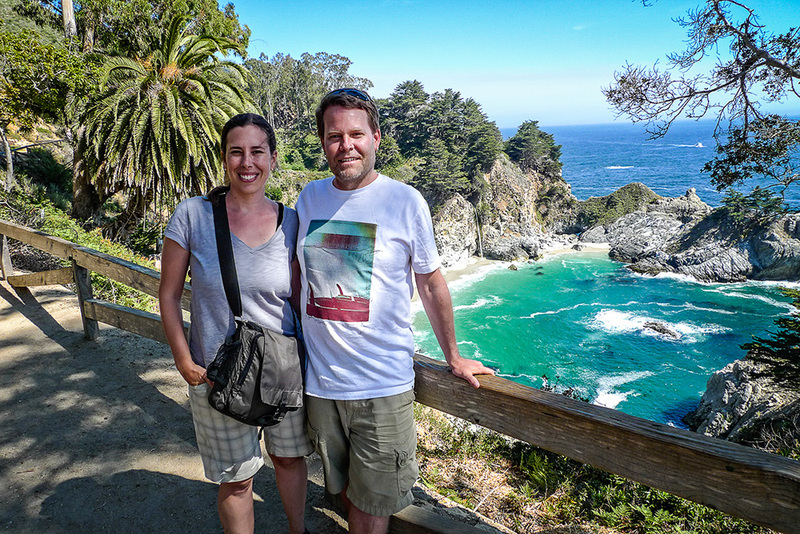 A relaxing vacation with lots of beach time, then driving up the coast was exactly what Katie and I needed. In Venice we stayed just off the famous canals at an apartment we found on Airbnb (here’s the place we actually stayed at). It’s a great place, and we’d definitely stay there again. We spent the week lounging on the beach, meeting up with friends, and hitting a few amazing restaurants while we were there. Windward Plaza at Venice Beach. 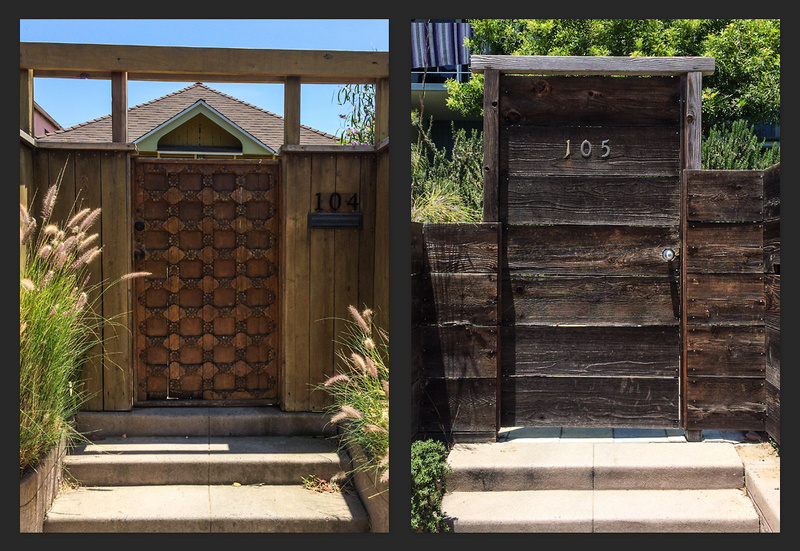 A couple of beautiful beach house doors in Venice, just steps away from the beach. 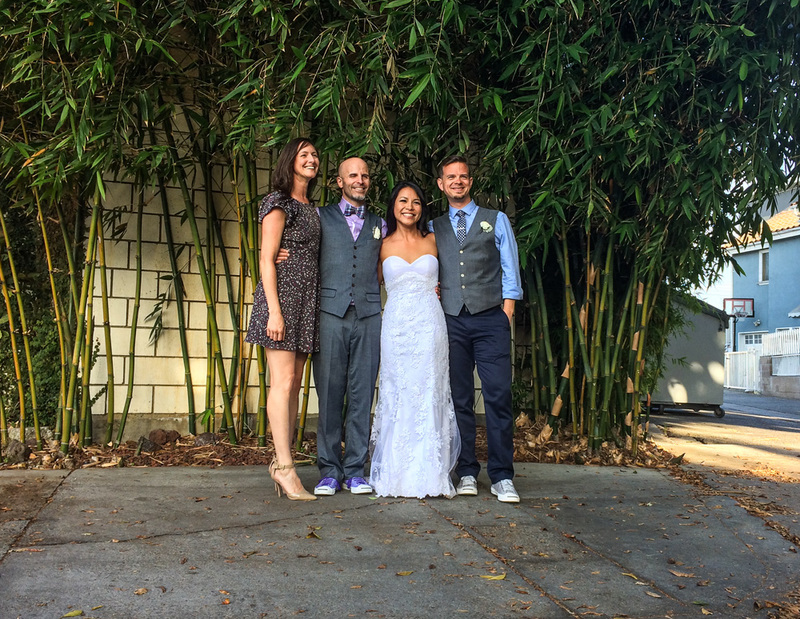 Jonathan and Wendy had their wedding at Smog Shoppe in Culver City, just outside of East LA. Back in the 80’s the place was a smog-check centre (as the name would imply); it’s an unassuming looking place from the outside, but is a gorgeous place for a ceremony and reception. The indoor/outdoor courtyard has garden walls filled with vertical gardens, mostly desert plants and succulents. 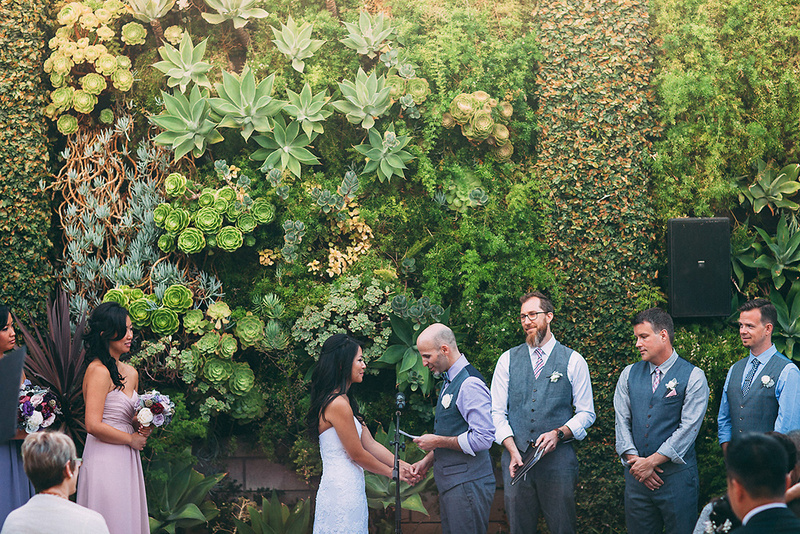 The happy couple mid-nuptials — just check out that succulent wall behind them. Photo by He and She Photography. The groom and his groomsmen; Jonathan (the groom) is third from the left in the back, and then that’s me on the far right. Photo by Chad Forbes. Lauren, the groom and bride Jonathan and Wendy, and Chad just outside the Smog Shoppe courtyard. 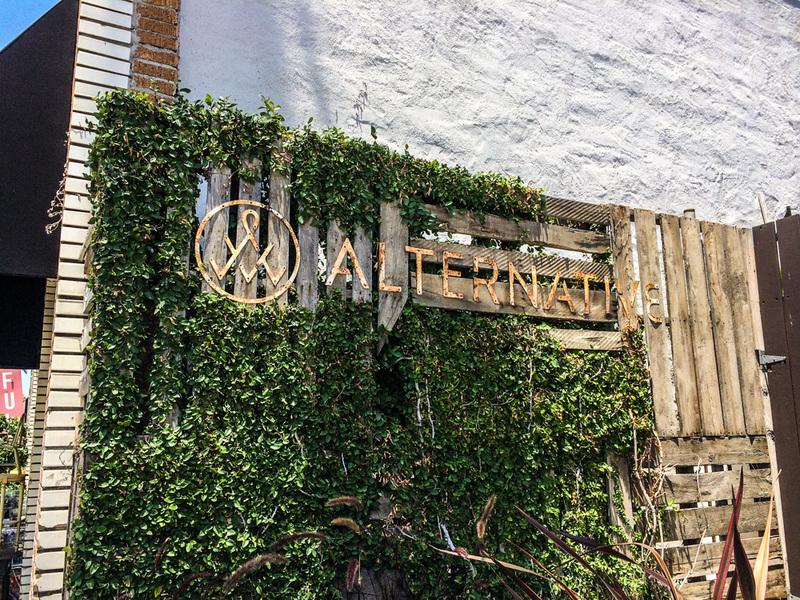 Both the inside and outside walls of the Smog Shoppe are packed with vertical gardens full of succulents and desert plants; it’s pretty striking. 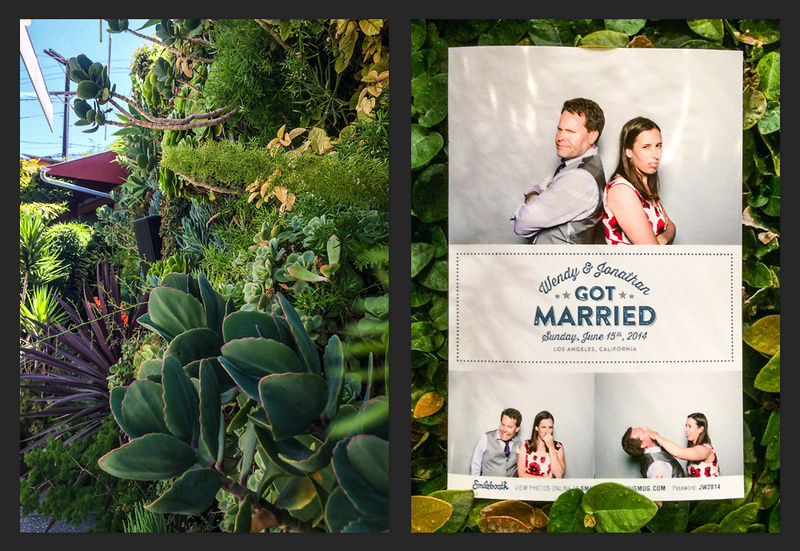 I used the wall of plants to hold of the printed photobooth shots they had on-site. 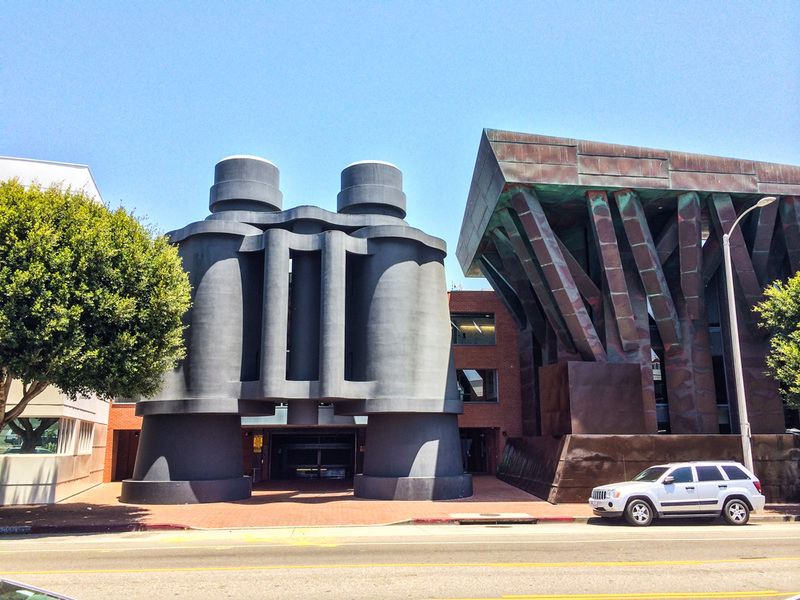 No trip to Venice would be complete without a visit to the ‘Binoculars Building’ (designed by Los Angeles architect Frank Gehry). 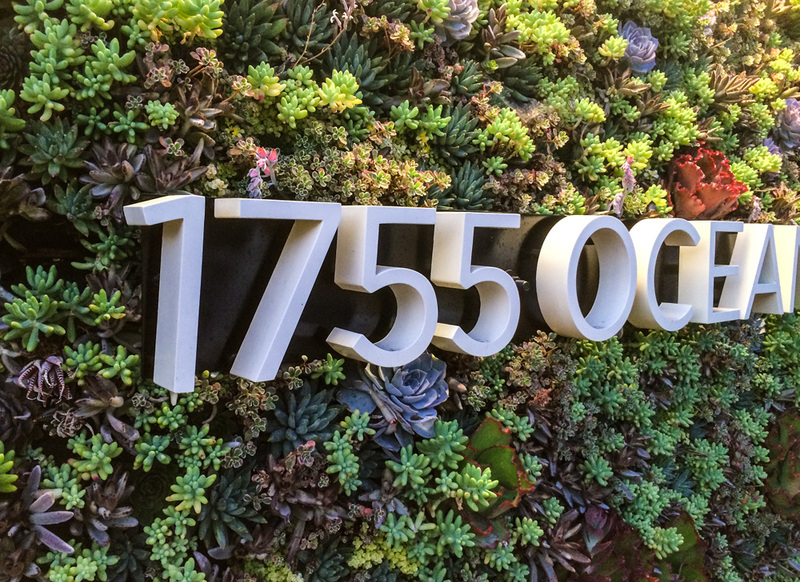 This building was custom designed for the Chiat/Day advertising building, but now houses Google’s Los Angeles campus. 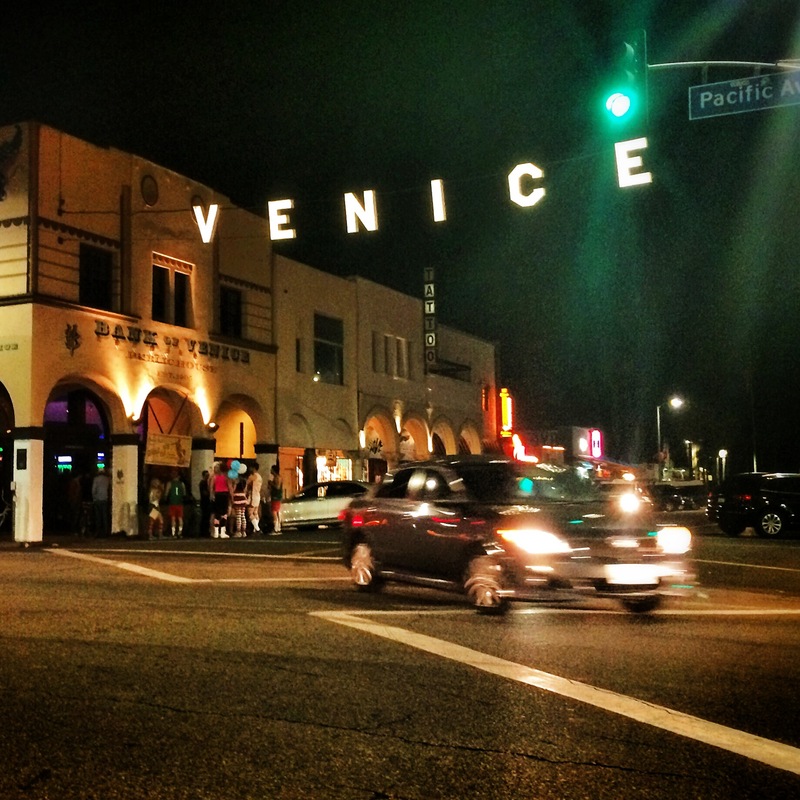 The eclectic area of Abbot Kinney is one of the most interesting parts of Venice/Santa Monica, with lots of independent restaurants and fashion shops, and plenty of great signage and modern architecture. 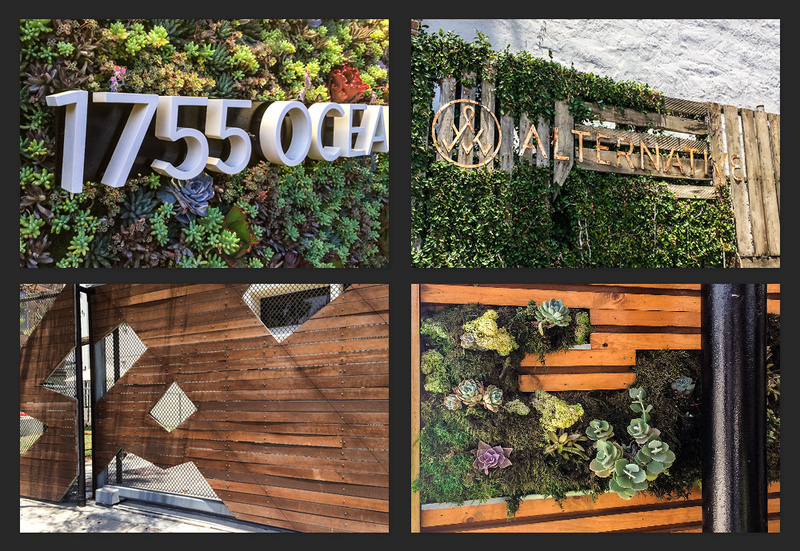 From top left: I love both these signs that combine greenery and living plants with the type. The reclaimed wood and rusty steel characters are perfect together. 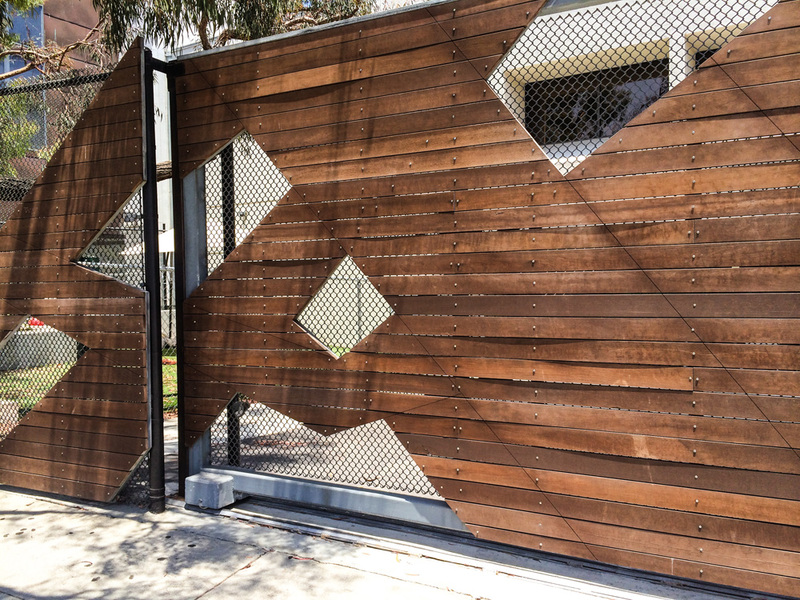 I love the simple design of this fence outside of Google’s LA/Venice campus. 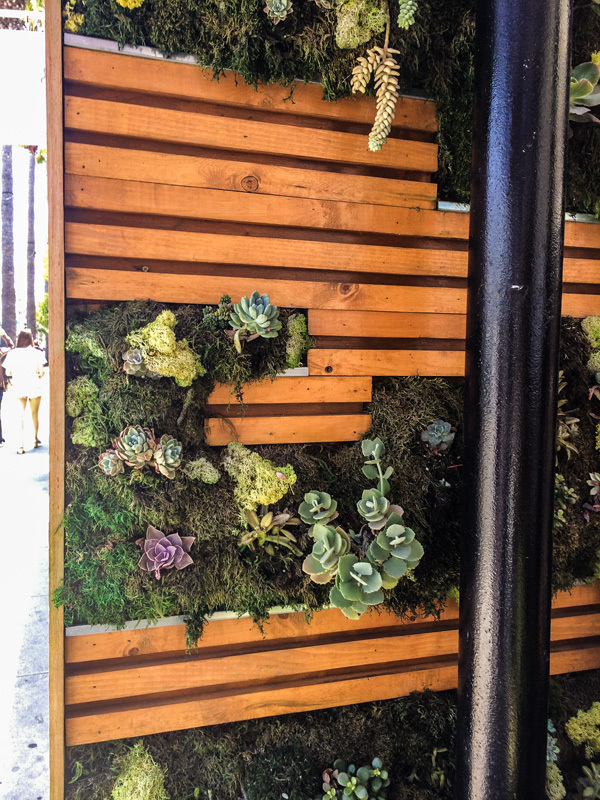 Kreation Cafe is a trendy organic restaurant cafe and juicery on Abbot Kinney; the succulents wall accents the front of the restaurant — great ideas for a succulent wall we’re planning for our deck. 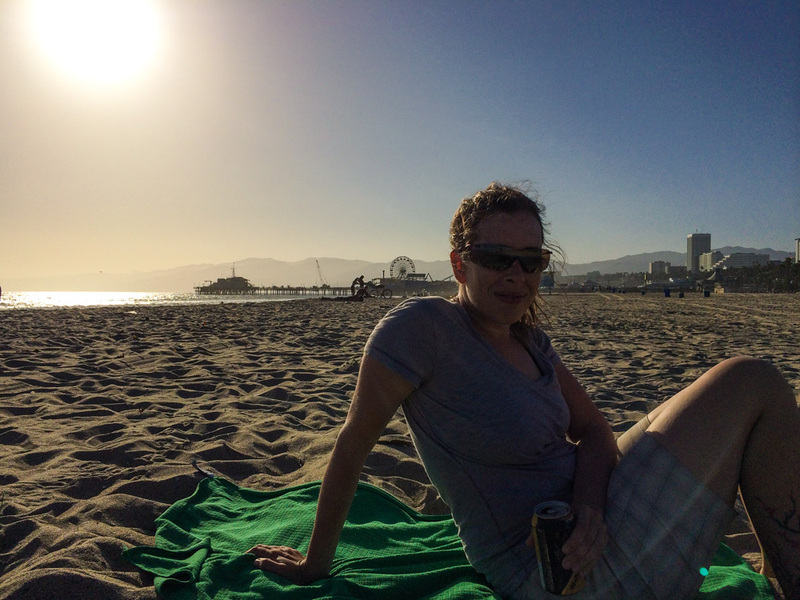 Katie on the Santa Monica beach; enjoying a drink in the late afternoon before we head up to Cha Cha Chicken for dinner. Some of the bridal party were joining Jonathan and Wendy for a day at Disneyland and California Adventure Park, so we joined in on the fun too. Since we were doing both parks in one day, we made efficient use of our time and hit many of the busiest rides in both parks by jumping in the singles line. My FitBit recorded that we walked 24,033 steps that day; that’s more than 17km and our feet were so sore after all that walking. It was a very hot day, so I’m pretty surprised we didn’t leave with sunburns. 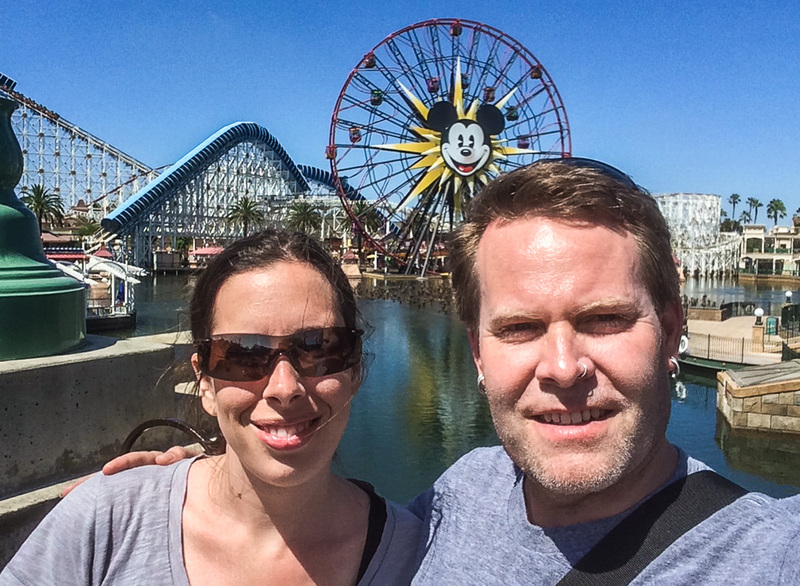 Katie and I at the California Adventure park. 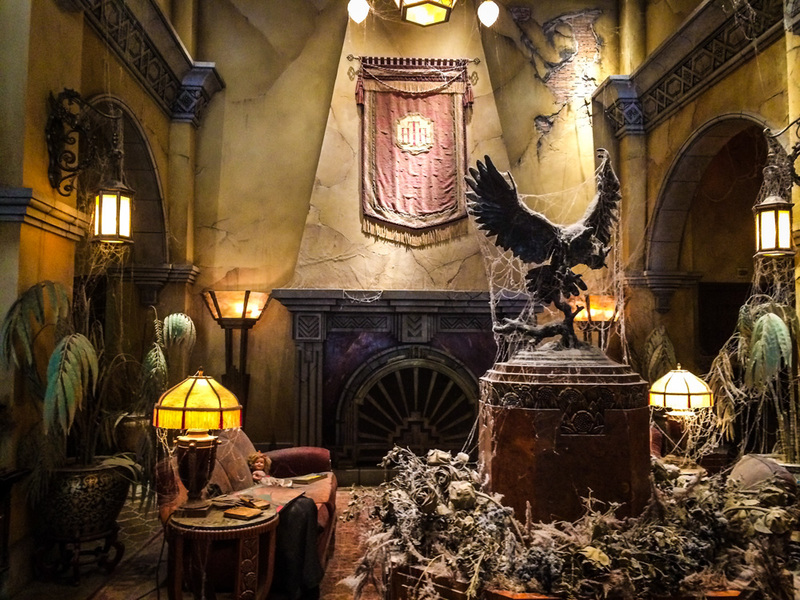 Lobby of the Tower of Terror (the Hollywood Tower hotel ride) at Disneyland – definitely one of my favourite rides there. They did an amazing job decorating this entire feature. 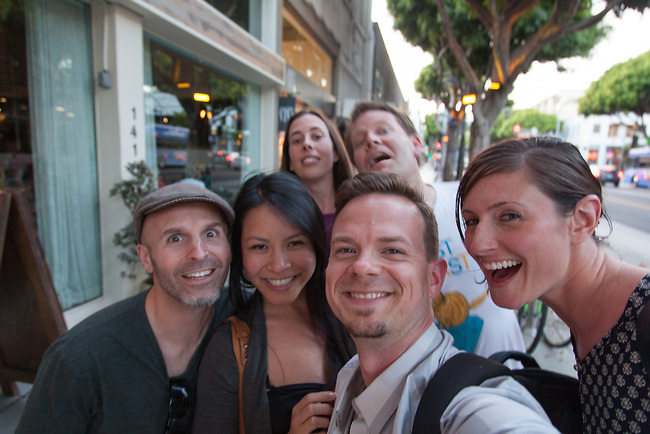 Our last night in the Venice/Santa Monica area; we met up at Mercado for a great Mexican dinner; (left to right) Katie, myself, Jonathan and Wendy. Photo by Chad Forbes. Saying our goodbyes in front of Mercado. Photo by Chad Forbes. 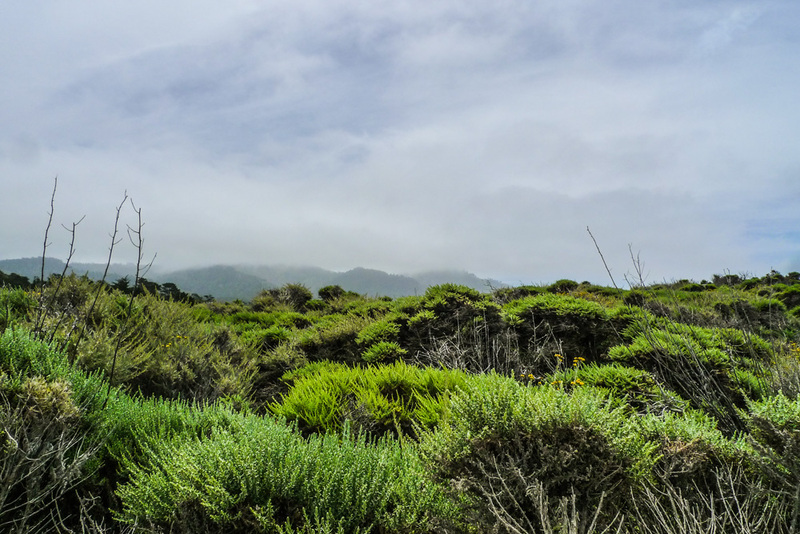 We started making our way up the coast, making a brief stop in Santa Maria, CA to visit Windset Farms’ 3-million square foot greenhouse facility. I had spent the last several months working on the interior design treatments of their office and wayfinding signage for the entire facility; you can see that portfolio piece here. 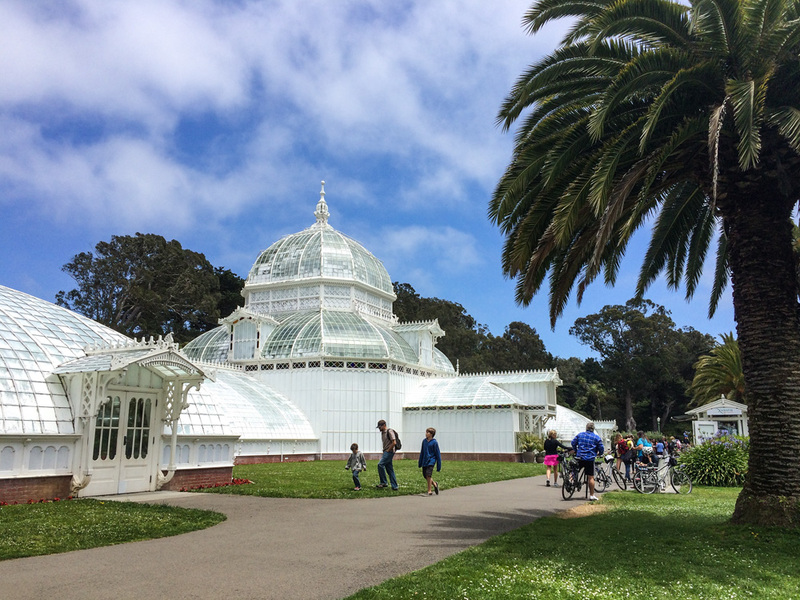 It was great to see this project in person — I’m really pleased with the completed project, and their greenhouse facility is HUGE! 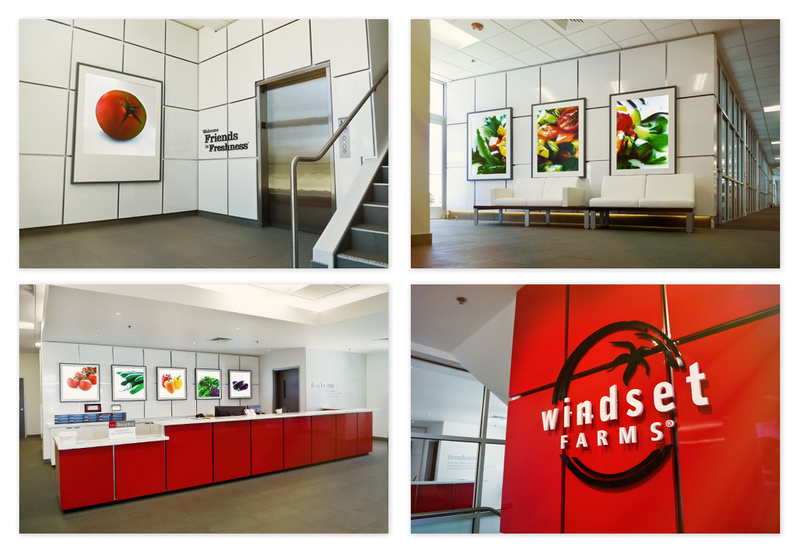 Overview of the work I did for Windset Farms office interior design treatments — see the link above to learn more about that project. Inside Windset’s cucumber greenhouse… That’s me dressed in the latest in greenhouse visitor fashion. 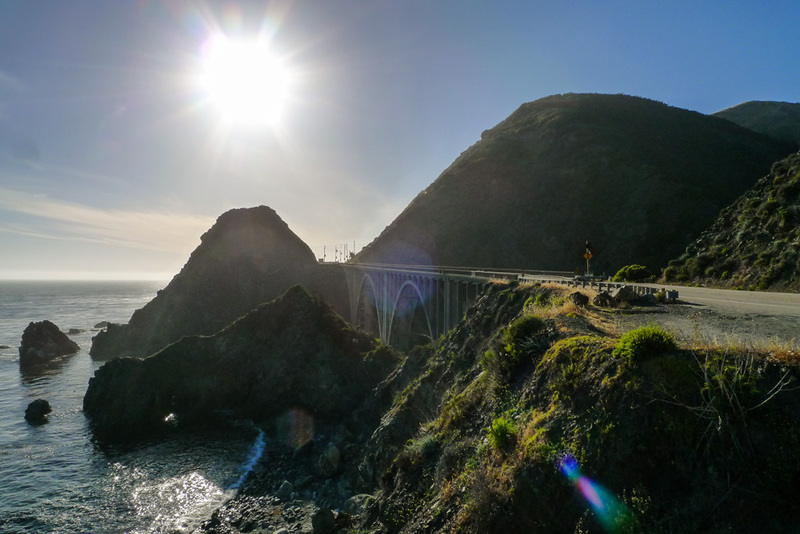 After a few hours in Santa Maria we continued north up the coast via Highway 1 to Big Sur. 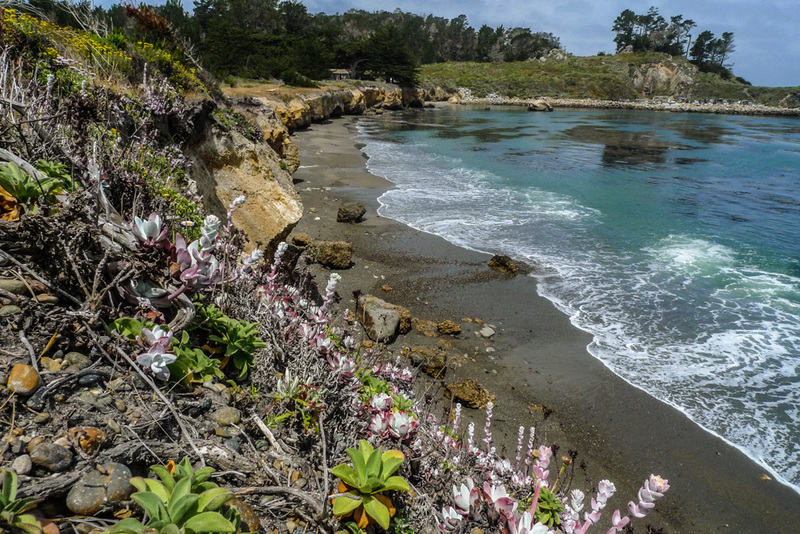 We made a few stops along the way, including the Elephant Seal Rookery at San Simeon. 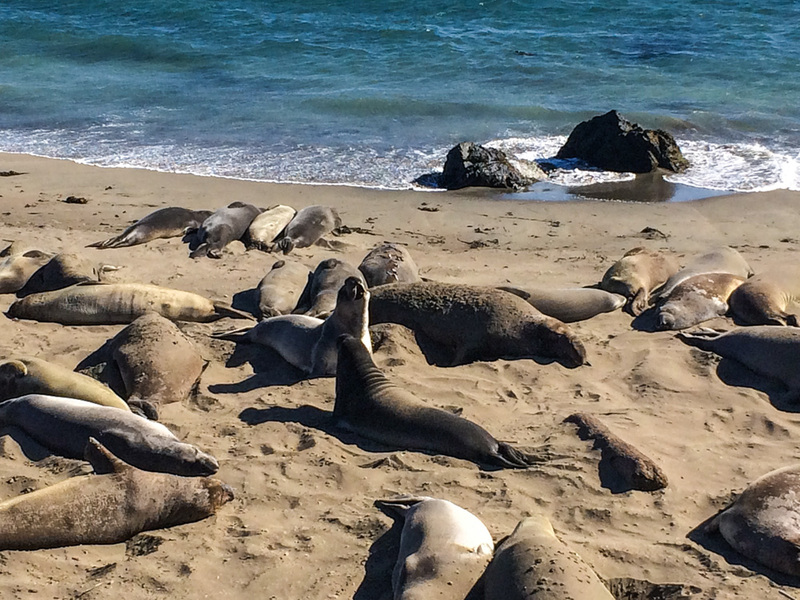 There was plenty of elephant seals lounging on the beach, and you can get pretty close to them. 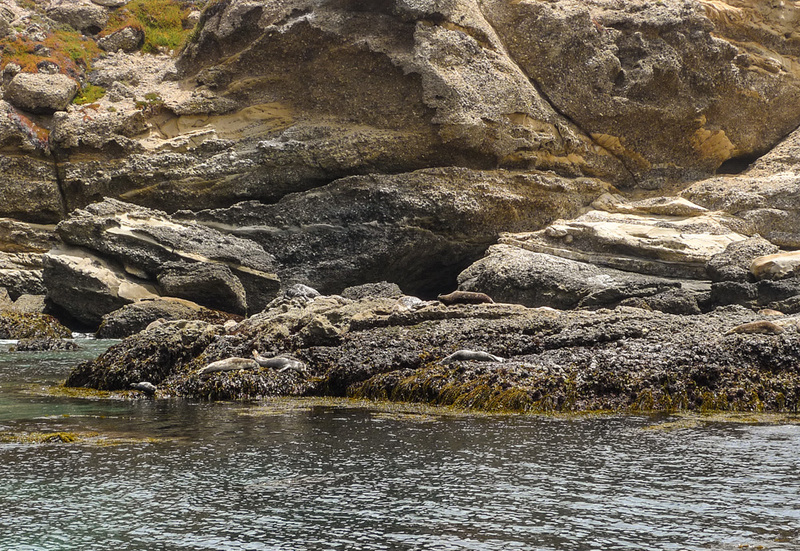 A couple of elephant seals bark at each other at the Elephant Seal Rookery at San Simeon, CA. 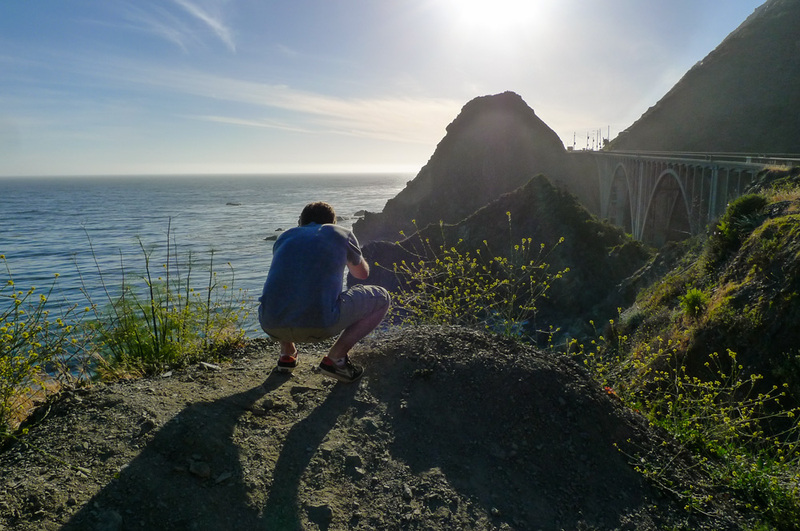 And here’s the actual photo I was shooting; the Big Creek Bridge (built in 1937). 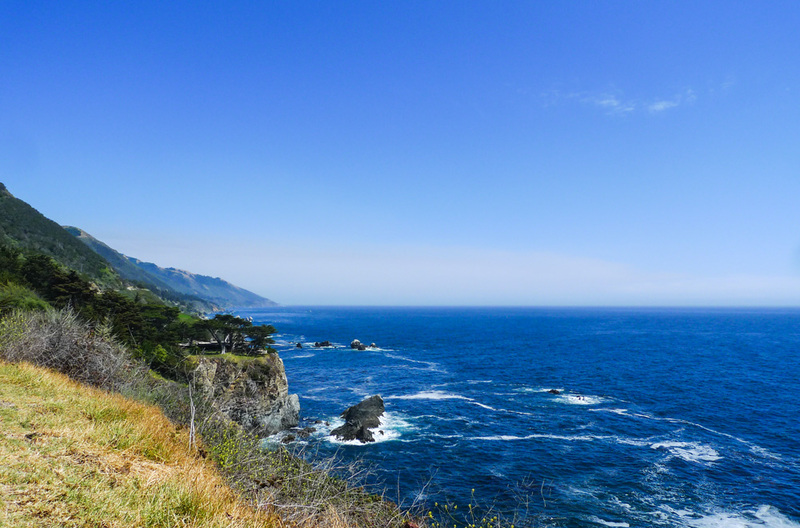 This is a pretty common vista along the stretch of Big Sur; and by ‘pretty common’ I mean epic. 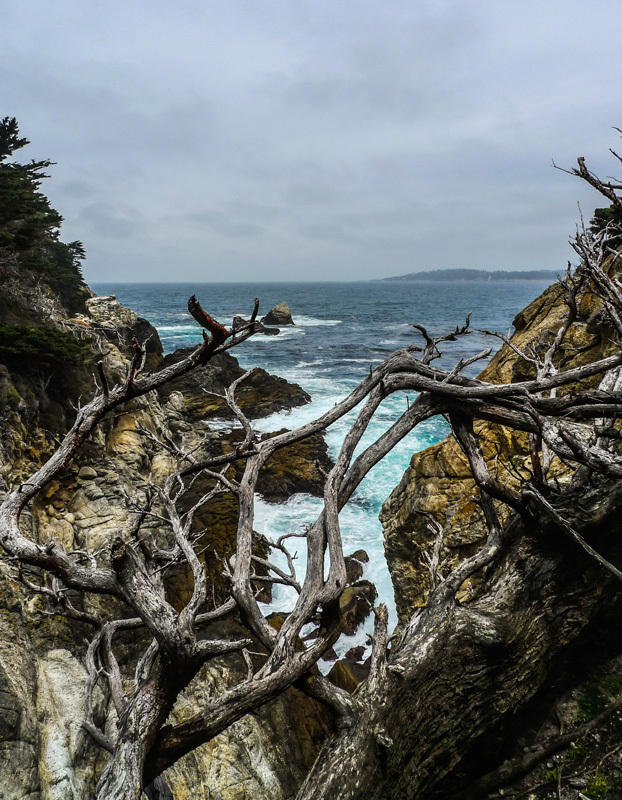 McWay Falls at Julia Pfeiffer Burns State Park in Big Sur — a short walk from the parking lot to see this stunning landscape and waterfall. A house used to sit just to the left of this photo frame; what an epic view they would have had. 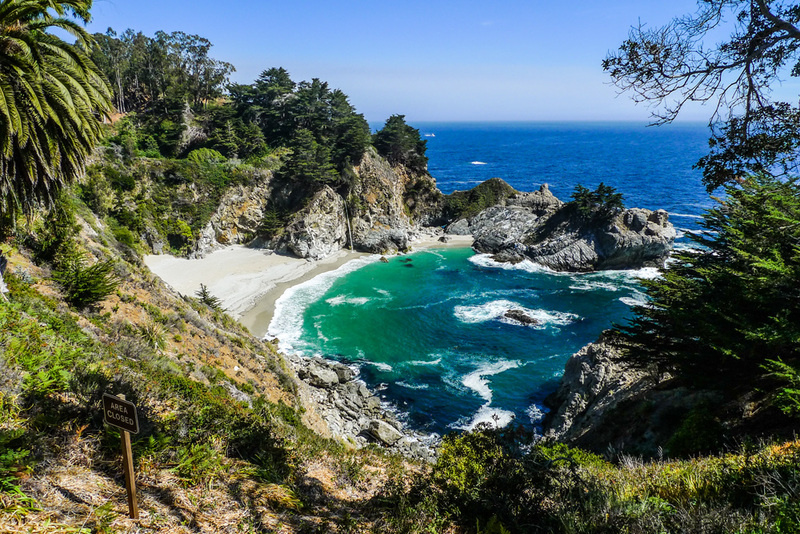 The colours at McWay Falls were incredible; the water was so vibrant it looked like the Caribbean. Normally on a trip like this we’d be camping, and we’d have all of our gear with us. We flew down for the wedding, and decided it would be too much trouble to bring tents and sleeping bags. 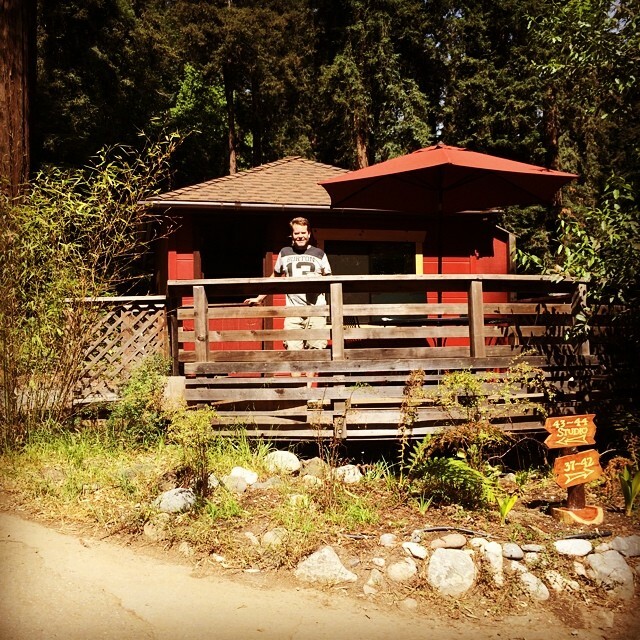 Katie found a rental cabin at Riverside Campground and Cabins in Big Sur; a lucky score considering these cabins are often reserved many months in advance. The cabin we rented at Big Sur… Were not often so spoiled to have a shower and washroom when we camp, so this was a nice change. 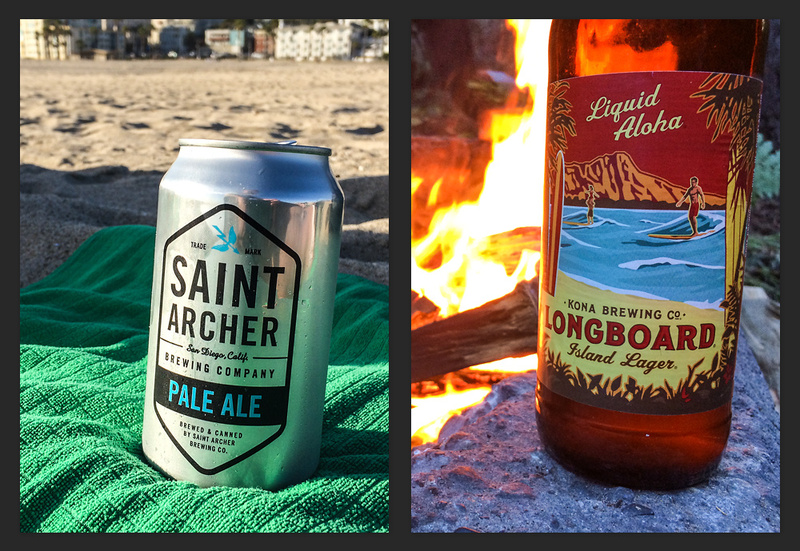 I picked up some craft beers along the way; I was stoked to find and try some Saint Archer beers; it’s a brewery owned by a collective of pro snowboarders, skateboarders and surfers like Todd Richards, Chris Miller and skate photographer Atiba Jefferson. Great stuff and the entire line is well designed too. The Kona beer is easy enough to get in Washington, but I wanted a good bomber to go with the campfire that night, and it hit the spot. 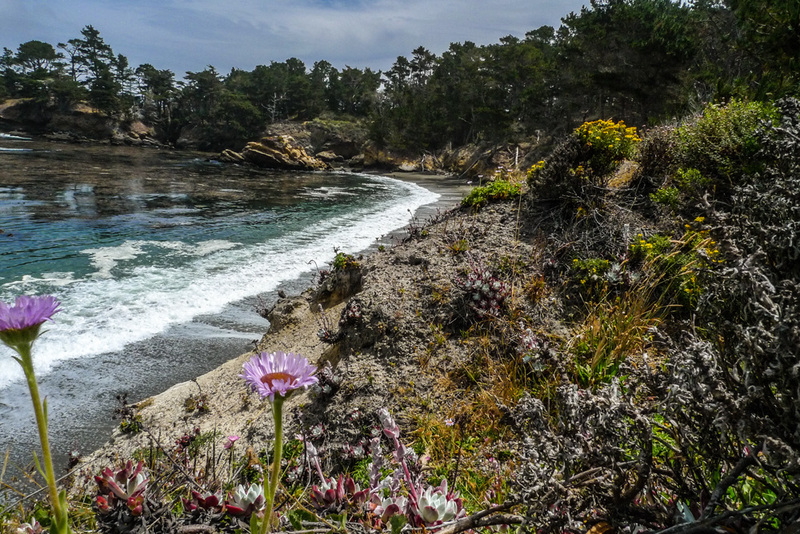 Point Lobos State Natural Reserve just north of Big Sur was a great discovery; it was an all-in-one stop for seeing an amazing park and sea animals. 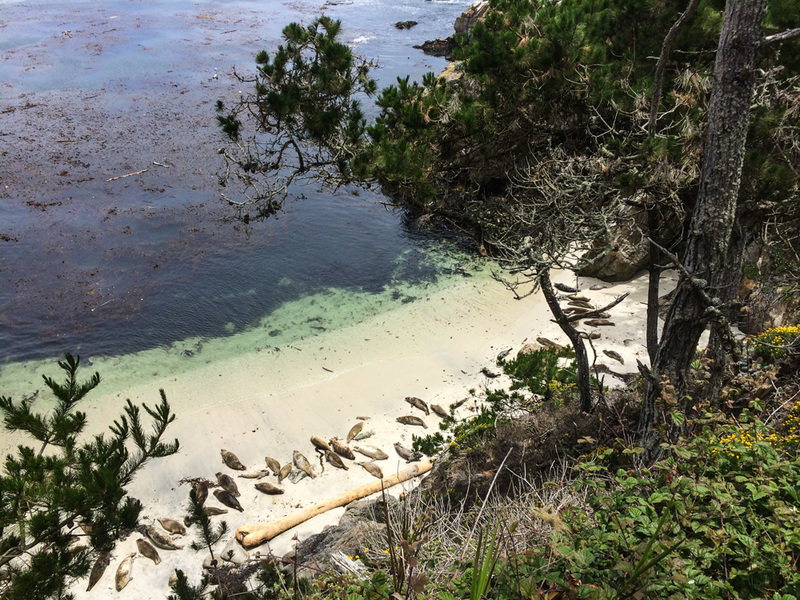 Lots of sea lions, California seals, and Stellar Seals. 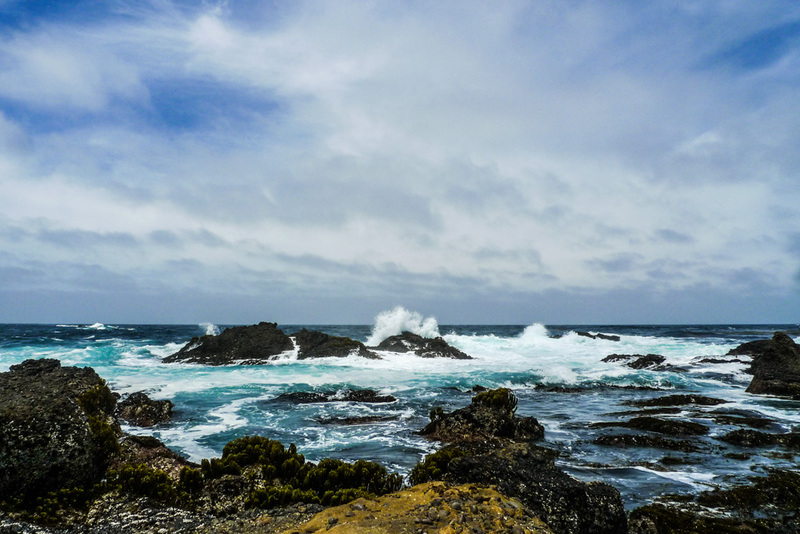 You can walk right down to the ocean and get up close to the seals, and get right in by the crashing waves. 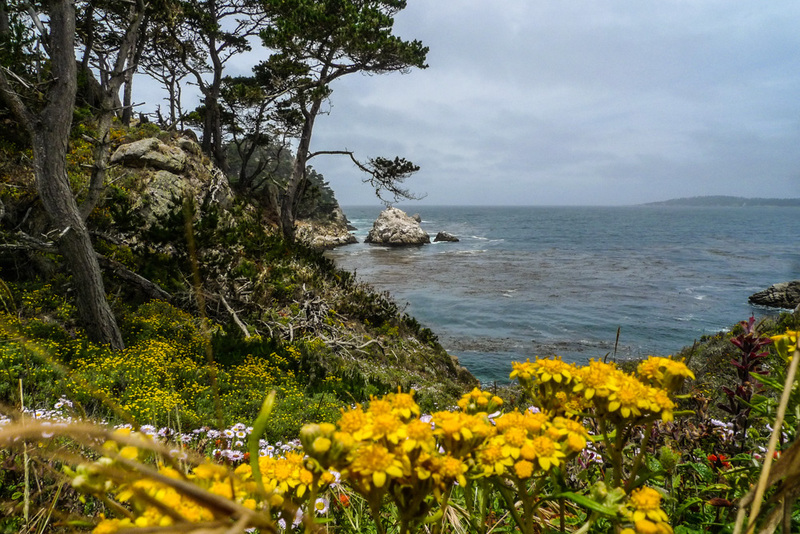 Point Lobos State Natural Reserve just north of Big Sur. 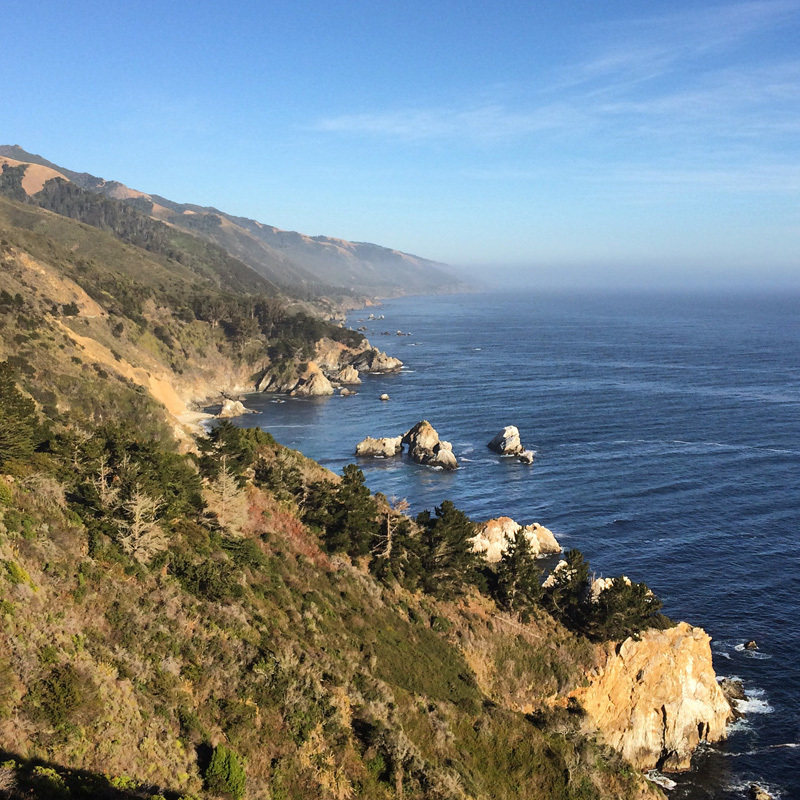 After a few days in Big Sur, we continued our drive up to San Francisco. 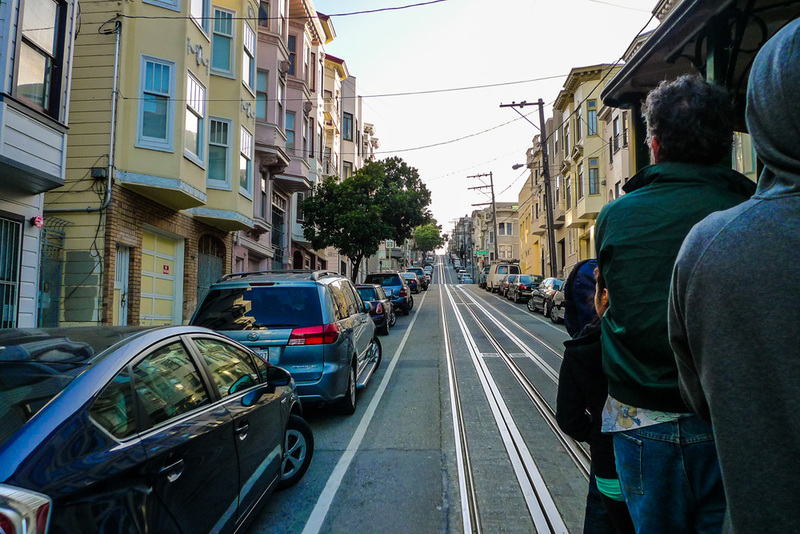 We found an apartment on Airbnb in the Mission District, so we’d be central to everything we wanted to do on this trip. 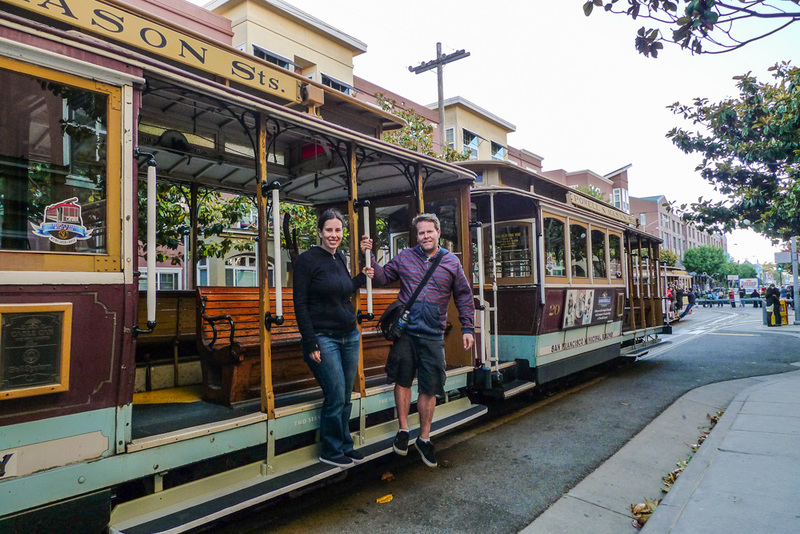 We had limited time in San Francisco, so we had to get into tourist-mode as soon as we dropped off our stuff in the apartment. We went to the streetcars first thing since it was late in the afternoon… What you can’t see in this photo is how cold I am. 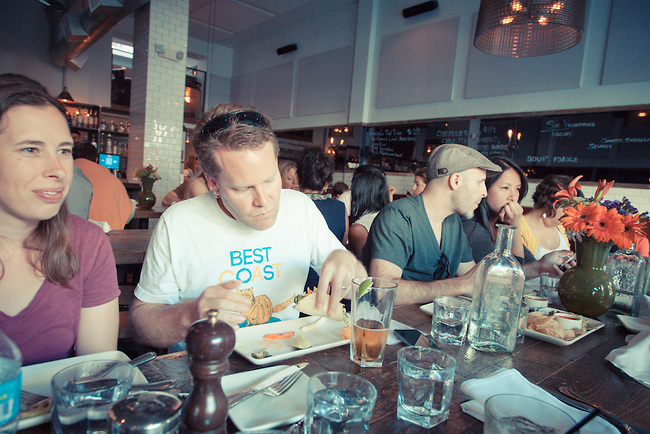 I was the only person in San Francisco wearing shorts that day in June — the locals know better. 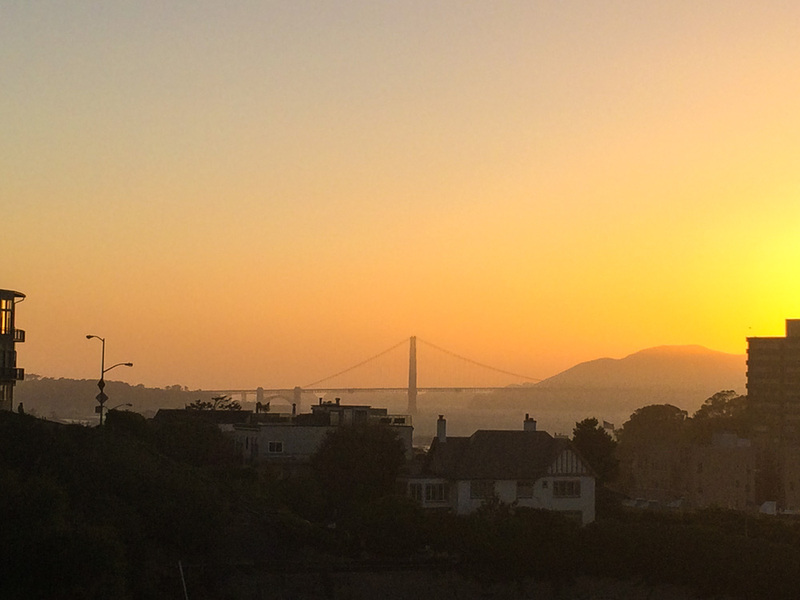 Epic sunset with the Golden Gate Bridge in the background. 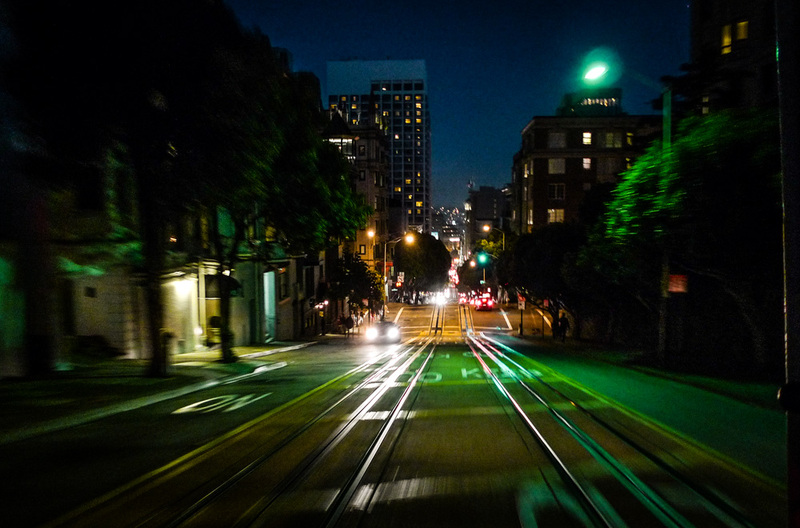 With the sun down, we finally made our way back to the apartment via cable car; my whole body was numb by this point. 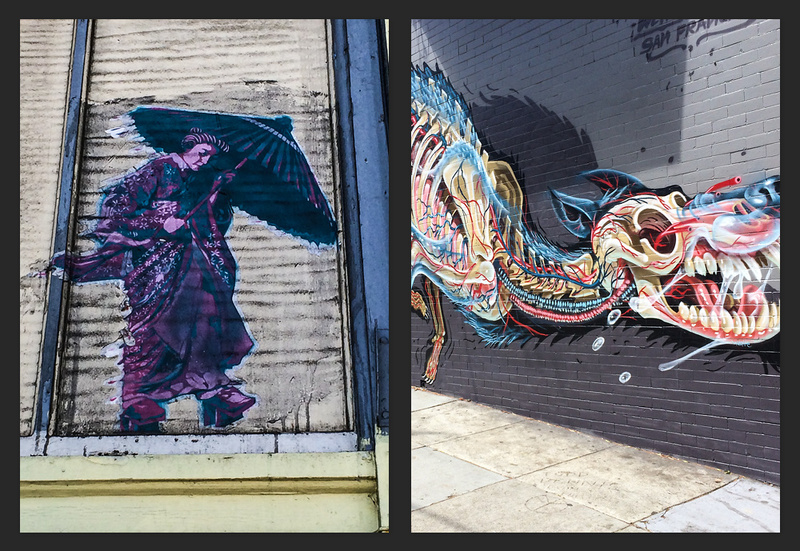 Street art in the Haight-Ashbury area was awesome… So much great stuff. 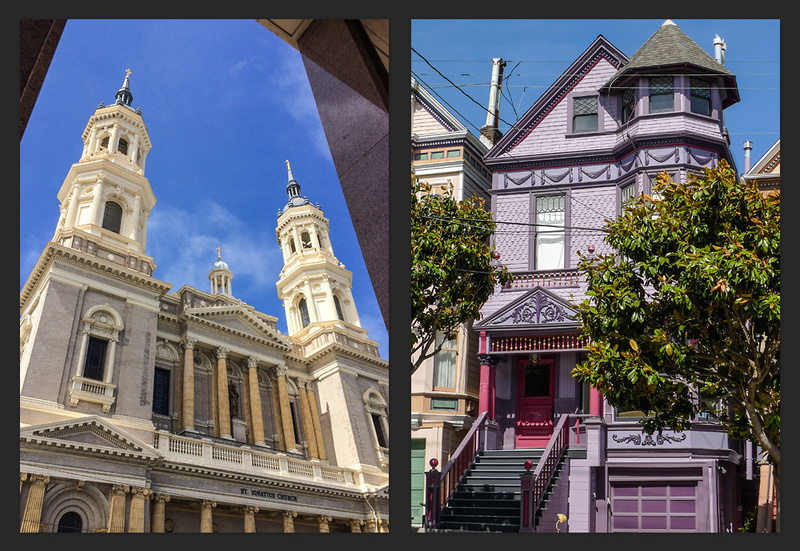 The buildings and houses in San Francisco; this was just a few blocks away from Golden Gate Park in the University District. 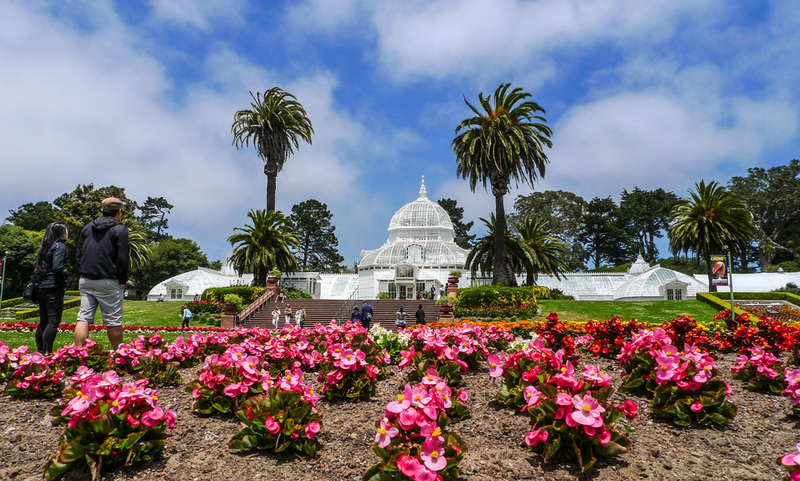 The San Francisco Conservatory of Flowers in Golden Gate Park; we didn’t have time to go in and see it, but it was a beautiful building. 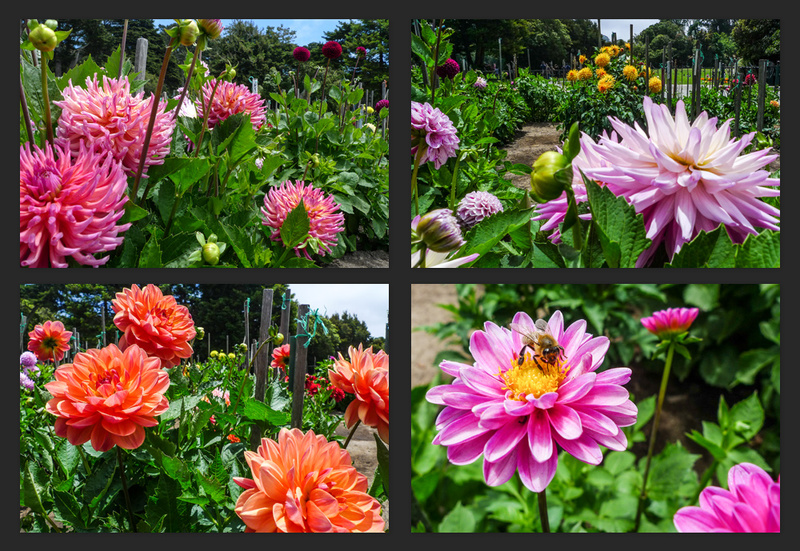 A dahlia exhibit outside of the San Francisco Conservatory of Flowers. 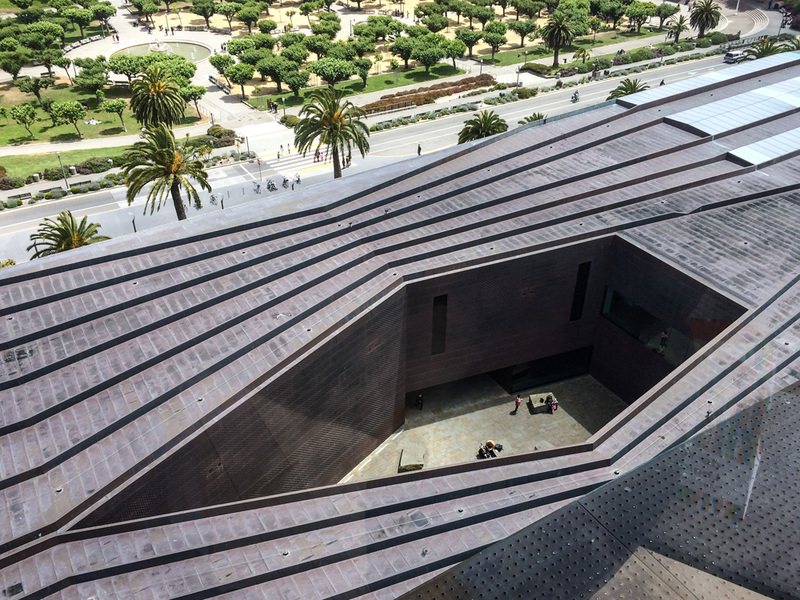 Looking down from the Tower at the de Young Fine Art museum. 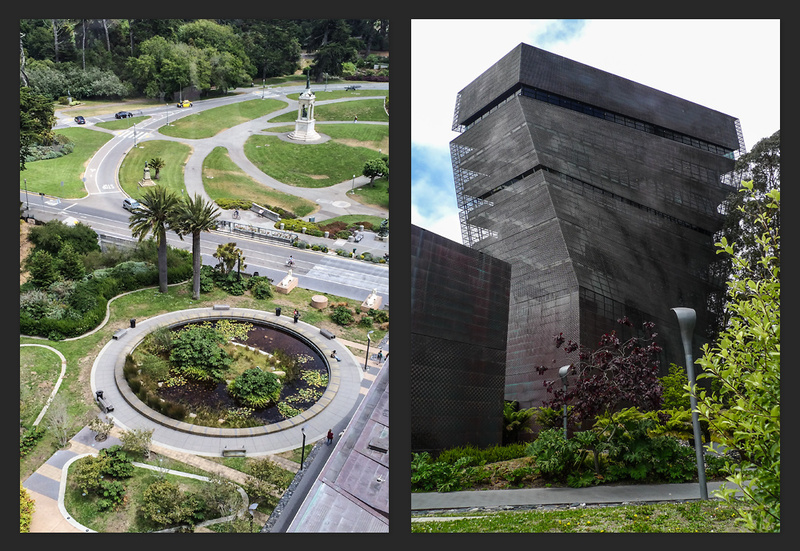 Looking down from the Tower at the de Young Fine Art museum; and looking up to where I shot the other photos. Such a wild-looking building. 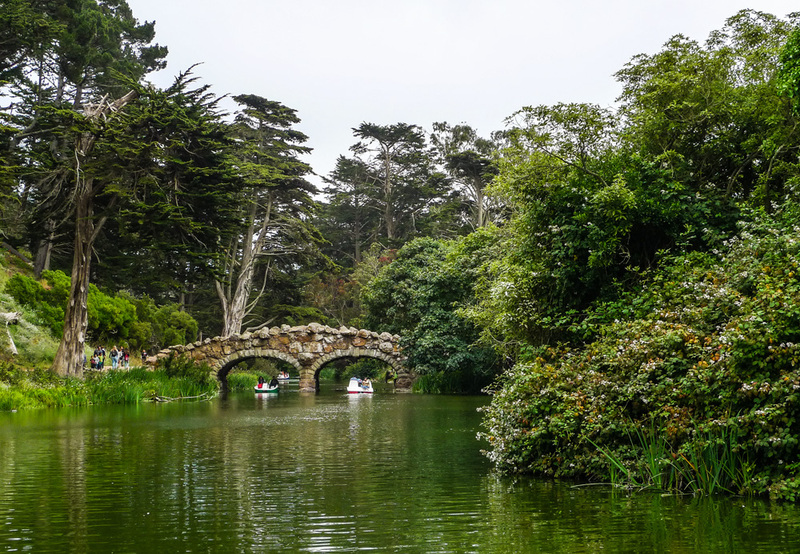 Rental boats make their way around Stow Lake in the heart of Golden Gate Park; a huge man-made lake completed in 1893. PHOTO GALLERY | This gallery has all the images from the above article, and plenty more; scroll through them with your ‘right arrow’ key.